Myasthenia gravis (MG) is a chronic autoimmune disorder that results in progressive weakness of ocular and skeletal muscles. 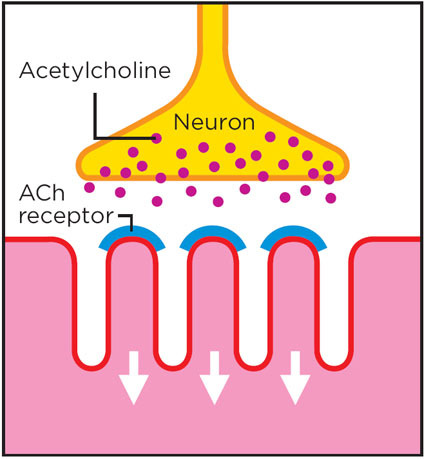 In acquired MG, antibodies attack and destroy acetylcholine receptor sites (AChR) in the neuromuscular junction, preventing nerve impulses from reaching the muscles. This results in weakness and fatigue in the affected muscles. 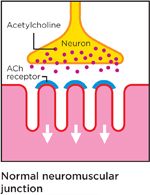 In the inherited or congenital forms of myasthenia, a genetic mutation produces a flaw in the neuromuscular junction, which affects transmission of nerve impulses. The onset of MG may be sudden, with severe and generalized muscle weakness, but more often the early symptoms are subtle and variable, making it a difficult disorder to diagnose. The hallmarks of MG are the fluctuating severity of symptoms and the varying degree of muscle involvement. The affected individual is usually strongest in the morning, experiencing increasing weakness with physical activity or as the day progresses. The symptoms may disappear or diminish with rest. Muscle weakness is often accompanied by an overwhelming fatigue that is also alleviated with rest. Myasthenia gravis affects one in 5,000 to 10,000 people. It occurs in all races, in both genders and at any age. The most frequent age of onset for women is between 20 and 40 years, and for men, after the age of 50. Ocular MG, found in 20% of cases, exhibits symptoms confined to the eye muscles. Individuals with congenital forms of MG are frequently affected from birth or in infancy, but some forms do not cause symptoms until adolescence or adulthood. Weakness caused by MG usually abates with IV administration of edrophonium chloride (very short-acting), or IM neostigmine, which has a longer duration of action. Three-quarters of patients with acquired generalized myasthenia and half with ocular myasthenia have serum antibodies that bind human AChR. 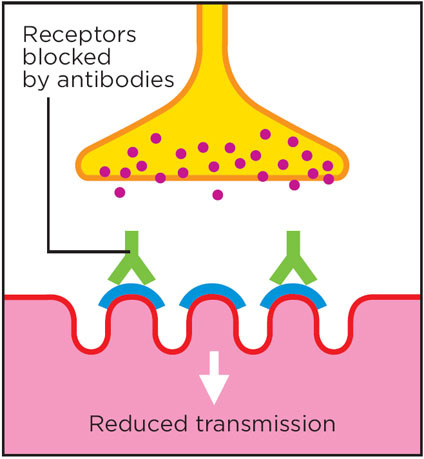 Another 10% of patients have antibodies inhibiting the action of proteins that modulate the turnover of AChR (MuSK). Others have no identifiable antibodies. Repetitive Nerve Stimulation (RNS) – A significant and progressive decrease in compound muscle action potential elicited by repetitive nerve stimulation is found in about 60% of MG patients. Single Fiber EMG (SFEMG) shows increased jitter in some muscles in almost all MG patients. Jitter is greatest in weak muscles but may be abnormal even in muscles with normal strength. Medications that reduce the body�s autoimmune response – Corticosteroids (Prednisone), Azathioprine (Imuran), Cyclosporine, and Cellcept. Surgery to remove the thymus gland, which plays a role in the autoimmune process in MG. 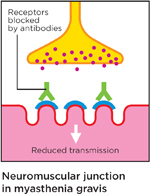 Plasma Exchange (Plasmapherisis), a blood-filtering technique that removes antibodies from the blood. Intravenous Immunoglobulin (IVIG) – Intravenous infusion of immunoglobulins that have been separated from donor blood, purified and concentrated.